Mysuru: State Higher Education and District Minister G.T. 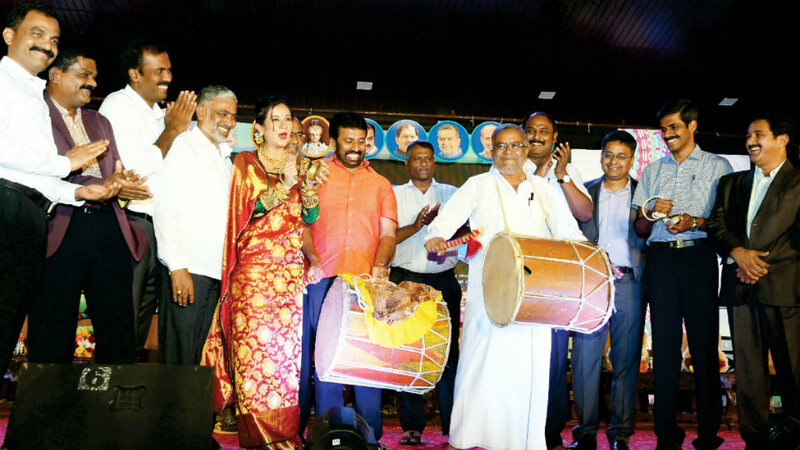 Devegowda inaugurated the Dasara Yuva Sambhrama-2018 celebrations, touted as the curtain raiser to ‘Naada Habba Dasara’ celebrations by beating the traditional drums with actress Harshika Poonacha playing a pair of cymbals at the Open Air Theatre in Manasagangothri campus in city last evening. Yuva Sambhrama celebrations will be held till Oct.7. On the first day of the event, hundreds of students from different educational institutions set the stage on fire by their scintillating dance and cultural programmes setting off the Yuva Sambhrama celebrations to a colourful start while the Yuva Sambhrama banner was unveiled by Ukraine dancer Uliya, who danced in air at a height of 100 feet from the ground with a bunch of gas balloons on her back. The crowd was astounded when she alighted shaking her hands and legs to a song. The focus lights in different hues mesmerized the audience. 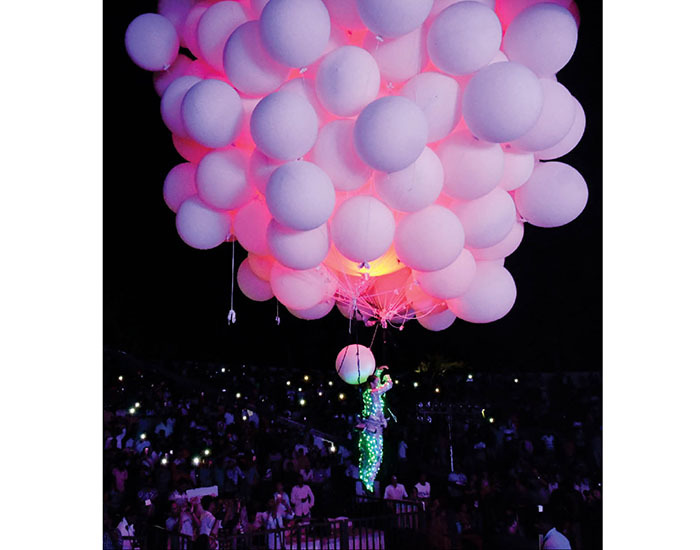 Ukraine artiste Uliya dancing in the air at a height of 100 feet from the ground with a bunch of gas balloons on her back was the cynosure of all eyes. The bubbly and chirpy actor of Sandalwood, Harshika Poonacha stole the show with her traditional attire and speech greeting the audience for the celebrations. She also sung a Kannada song on ‘Neenaadena nee olida ee kshana’ which pulled the crowd. The dance performance on patriotic theme ‘Hey Bharat Mahan, Hey Bharat Mahan’ by Karunamayi Special Children Training School students touched the hearts of the participants. Over 30 students of Government First Grade College students of Chamarajanagar performed dance on ‘Andada Giri Chenda Nodiro.’ They also exhibited another folk dance at the same platform. Students of JSS Composite PU College for Women, Yalandur, Vishwashanthi Educational Institute of Saraswathipuram in city, Independent Arts and Science College, Sri Chayadevi B.Ed College, BGS B.Ed College, Government PU College (Kannada and Culture, Bharathi College of Bannur, Government First Grade College of Kuvempunagar and Government First Grade College for Women of K.R. Nagar also performed on various themes. 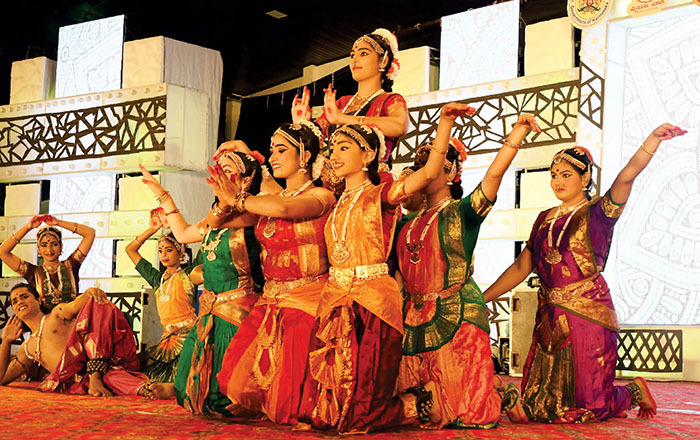 Apart from these, students of Sri Vivekananda Composite PU College of Jayalakshmipuram, Sarada Vilas Educational Institutions performed dance on National Integration, Maharaja Institute of Technology of Mysuru presented dance on empowerment, Bettadapura Government PU College students performance on patriotic theme were the highlights of the day 1 of Yuva Sambhrama-2018. Thousands of youths and College students from different parts of the city thronged the venue to witness the event. The audience enjoyed the show with deafening applause and whistles and by clicking pictures and videographing their favourite performances. Rain started when the celebrations went on. However, it failed to dampen the spirits of youths and other participants at the event. MLAs L. Nagendra and Ashwin Kumar, DC Abhiram G. Sankar, SP Amith Singh, MCC Commissioner K.H. Jagadeesha, ADC Yogesh, Yuva Dasara Sub-Committee Working President M.N. Nataraj and others were present. Yuva Sambhrama progra-mme will go on till Oct.7 with various college students performing between 6 pm and 10 pm everyday.